Caltrans is continuing to rebuild and repair six bridges along State Route 192 following debris flows and flooding in the Montecito area this past January. Caltrans is working cooperatively with our utility partners to repair and replace the damaged structures on State Route 192 and restore full access for the local community. They have been working steadily to relocate vital utilities while maintaining service to the community. Caltrans is striving to complete work within the creeks before the winter storm season. The contractors have been working as quickly as they can once utilities are relocated. 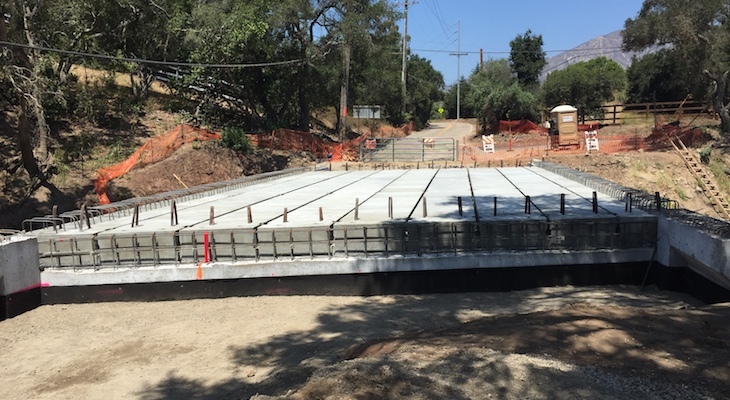 New girders for the Toro Canyon Creek Bridge (PM 12.49) were installed July 24. This bridge is expected to be re-opened to traffic with some restrictions by the end of October. New girders for the Romero Canyon Creek Bridge (PM 10.92) were installed July 26. This bridge is expected to re-open to traffic with some restrictions by the end of October. The Montecito Creek Bridge (PM 8.12) was demolished on July 26. Caltrans intends to set the precast bridge on the abutments in mid-October. It’s anticipated this bridge will be re-opened to traffic with some restrictions by the end of December. The San Ysidro Creek (PM 9.6) Bridge is currently open to two-way traffic. The repair of the bridge rails is scheduled to be completed by mid-September. The Toro Creek Bridge (PM 12.14) is currently open to one lane of traffic. The construction of the new bridge rails will begin following the replacement of the Toro Canyon Bridge so that gas service can be maintained for residents in the Toro Canyon area. This bridge work is expected to be completed by the end of November. The contractor for the $20 million project to replace these bridges is Security Paving Company of Sylmar, CA. Construction at the Arroyo Paredon Bridge (PM 15.50) continues with the ongoing relocation of utilities. Abutment foundations for the pre-cast bridge deck are expected to be in place by the end of September. This bridge is expected to be open to the public by the end of December. Lash Construction of Santa Barbara is the contractor for the $10 million replacement of this bridge. The schedule for these bridge projects is subject to change based on Caltrans, the contractors and the pending completion of work by the utility companies.